ConverTables are the most versatile school tables; the ultimate ‘do anything’ table. Whether you want your hall to be a dining hall, a lecture room, or an auditorium, ConverTables can do it all. 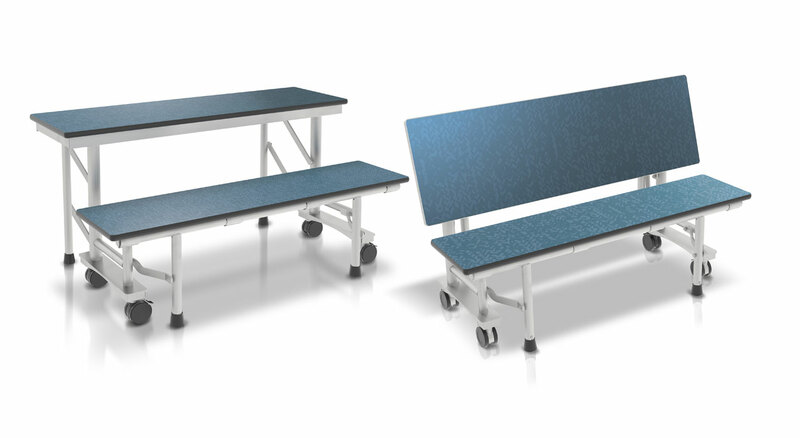 These mobile tables easily transform from a single-sided lecture table, to a useful bench to a full-sized cafeteria table with little effort, in just a few moments. They move quietly on easy-glide castors and nest neatly for easy storage in a minimum of space. Their robust design ensures they’ll stand up to the rigours of education use and the 15-year warranty gives complete peace of mind. Versatile – transform from a single-sided table to a useful bench table to a full-size cafeteria table. Cost-effective – one table does three jobs and takes up a minimum of storage space. Safe and stable – eight points of floor contact including four seat-support legs. Lightweight – non-marking castor wheels are quiet and ensure the tables move with minimal effort. Secure – the safety latch is discreetly located under the tabletop – out of the sight of students. Customisable – ConverTables can be customised with a graphic of your choice; liven up your hall and give your table an identity!